I have been a social media fan for quite some time but this had mainly been for personal reasons rather than for business. It was very interesting to me to be able to connect with people around the world who would never have the opportunity to meet before. Also, to be able to reconnect with old colleagues and friends also had its own value to me. But as I moved on in life and in my career it became very apparent to me that social media has very powerful advantages for promoting both your and your business. First of all, social media is very inexpensive and it can be extremely well targeted. As such, I would highly recommend that you have a look at what both you and your company are doing in regards to this type of marketing. And if you aren’t doing anything, for Heaven’s sake, get on board! The first and foremost of my recommendations goes to LinkedIn, an incredibly useful tool that makes it simple to do searches of the networks of your own personal contacts I will definitely say that it is one of the best and most recommendable tools that I use. I have used LinkedIn to find prospects for my business, many of whom have become clients subsequently. But I have also booked entire international conferences in Manila, Dublin, Dubai, Tunis, Prague and Bangkok by using the contacts that I found entirely through LinkedIn. I have hired employees and found services providers (printing companies, accountants, travel agents, lawyers, etc.) through LinkedIn. I found experts for books and articles that I have written through LinkedIn and I have even found old colleagues and met people of similar interests such as libertarian politics and Esperanto language who I have visited as I traveled the world. These days if you care about your career and your company it is advisable to have some kind of presence on LinkedIn. Period. Second is Facebook. Yeah, yeah… That’s the one that everyone is bothering you about. Hook up with old classmates. Share some photos with family. But Facebook has many features that businesses, especially in the service industry, should be aware of. On Facebook you can create fan pages and group pages and advertise these pages for free through your own networks (people you are your Facebook friends and anyone else who joins your page). This is very good, targeted exposure for your services and best of all, it is permission marketing. People join your page or group because they want the information that you are putting out. It’s a “win win” situation. Also I have had people tell me that Facebook is only good for those in the service industries like professionals and not for people who are traders or manufacturers. I used to agree until a little while ago when I met “Henry”, and Indonesian businessman who trades in off road vehicles. He told me that his Facebook page has brought him more than US$ 100,000 in new business in the first half of this year. For a cost of just a bit of set up time and zero dollars, I would say Henry’s Facebook page is an excellent investment! Next is Twitter. Yes, I am a twitterbug. I have two accounts. One for my business and the other for my writing. Twitter is a microblog service that is gaining in status daily and becoming an incredibly useful public relations and information dissemination tool not to be overlooked. And it is incredibly targeted because, again, it is permission marketing. People who are interested in what you have to say follow your tweets because it is relevant to them. Social media can provide you with a highly targeted global audience at little or no expense. And the people you connect with are the exact people who want to hear your message. The key is you have to participate regularly and in a professional manner. But if you do so, I am sure that you will see your business grow. And that’s why I am telling you about it. Gary Dale Cearleyis the managing director ofAdvanced International Networks Ltdand is also a columnist and writer. 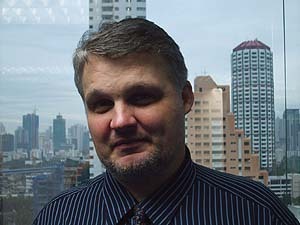 Promotion Points is a monthly column in the magazineManagement Systems Asia, where Gary Dale is a regular contributor. You can follow Gary Dale on Twitter by clickinghere.